If you’re wondering what to put on your LinkedIn profile, you have come to the right place. When it comes to things like your work experience and bullets, your LinkedIn profile should be shorter than your resume. Assume people are reading it for a just a few seconds per job listing. So pick your top 3-4 bullets from your resume per job, and put those. But cut the rest out. Also consider including a one-sentence description of your work in each role too, just above the bullets. This is typically a bit longer on a resume, but if it’s already just one sentence on your resume, you can copy it over. If not, I’d shorten it a bit. The only exception to this rule: The “summary” that appears below your name but above your work history on LinkedIn. I’d recommend that be 2-3 sentences on your resume, and around the same length on LinkedIn too. So that’s something you CAN copy over. If you’re not sure how to write a resume summary that’ll stand out and impress employers, you can learn how here. Why Does My LinkedIn Need to Be Brief/Concise? It doesn’t. There’s no “golden rule” here. Some people will read more content if you put it. But here’s the thing… the goal of your LinkedIn (or resume) isn’t to get them to read every word. It’s to make them reply and invite you to interview, right? They might still have some questions and want to know more after reading your LinkedIn, but they’ll see enough that they want to talk. And that’s the goal. They’ll find out the rest by asking you questions in the interview. And keeping things brief will force you to focus on narrowing down your bullets and accomplishments to just the most impressive. If I told you to include 10 bullets per job, you wouldn’t be as selective and wouldn’t write great bullet points. But if you limit it to 3-4 bullets per job like I’m suggesting, your LinkedIn profile will have nothing but awesome bullets. Taking the time to “trim the fat” and put only your best highlights on LinkedIn is going to make you stand out while also making your profile more attractive to read/skim, which is what you want as a job seeker. Employers LOVE it when you advance within a company, get promoted, etc. So any time you can show that, do it. Note that your profile should definitely have more detail than this. I edited this down because it’s very far in the past, I’m not job searching, everyone knows what the job title “Executive Recruiter” means, and I mostly want to show the advancement I made and the leadership I started doing here. But in your 2-3 most recent jobs… make sure to put more detail about what your job actually involves. Aim for around 4 bullet points like I mentioned earlier. The #1 thing hiring managers and recruiters want to see is what you’ve worked on and accomplished recently. One more note about showing advancement and progression: This doesn’t always need to be an official change in job title or salary. If you had a change in responsibilities (like starting to mentor/train new team members), you can still mention it on your LinkedIn and show how you progressed (even if your pay and/or job title stayed the same). Now, if you’re job searching with no experience, or right after college, this won’t matter for you because you don’t have a ton of jobs to list anyway – but if you have many years of work experience and many past jobs… spend more time (and space) on your LinkedIn profile on the 2-3 most recent jobs! So for example, the most recent job could have 4 bullet points and a 2-sentence description above it. The next job down would have 3-4 bullet points and a 1-sentence description. By the time you get to the fourth or fifth job, it might just be a one-sentence description with 2 bullets, or just 2-3 bullets. That’s not some rule that you have to follow 100%, but it’s the general pattern you should follow – use most of your time, and most of the space on your LinkedIn work history, for writing about your most recent work. Just like on your resume, considering removing a couple positions entirely if they’re far in your past and unrelated to the jobs you’re applying for now. There’s no rule that says you need to list every previous job when writing your LinkedIn profile or resume. You can also see how I used very simple formatting to grab attention in the screenshot above. I just typed “–” before the descriptions, and it stands out visually in the example above. So you can consider doing something like this too but don’t overboard. No recruiter or hiring manager likes a profile flooded with symbols, emojis and other graphics making it hard to read or focus. So find one or two small things to do that’ll stand out, but then keep it very simple and focus on writing awesome content that’ll make the reader want to set up a phone interview or talk to you. Also, copy what looks good on other profiles. Borrow ideas. If you think the best writers out there don’t take ideas from others, you’re wrong. So you don’t need to start with a “blank page” for any of this. Look around at other people in your industry, take an idea here or there, make note of what looks good and what definitely does *not* look good. Now, don’t go copy one person’s LinkedIn profile. Don’t plagiarize. But do take inspiration. This is another reason we can’t just copy word-for-word from your resume when writing your LinkedIn profile… because LinkedIn offers some sections/features that aren’t on a typical resume. So you’d miss some of the best things you can put on your LinkedIn profile. Recommendations – This is one of the most powerful ways to immediately signal to employers that you’re great at what you do. If you don’t have at least 3 recommendations on LinkedIn, here’s how to ask for them and get them. Skills – Make sure to fill out your “Skills” section with all 50 slots allowed. Why? These will help you appear in more searches that recruiters and employers run. So if you want to get hired, think about what skills you want people to see your name listed under, in a search. This is really the only way to “cram” your profile full of great keywords and search terms without looking spammy, so take advantage. Attachments/Case Studies – You can attach all kinds of documents to your profile in various places, including under specific jobs you’ve held. That’s another way to make your profile stand out. So think about if there’s anything you can create, re-purpose, and attach to grab attention. 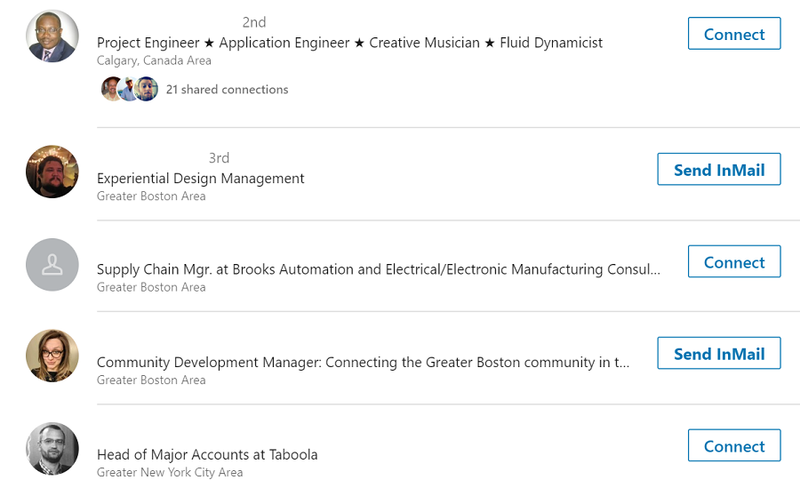 Here’s a screenshot of a search I ran on LinkedIn (with names removed). Which profile would you be least likely to click? As a Recruiter… I’m probably not going to click the person with no profile image. Not having a LinkedIn profile photo is a big mistake if you’re job searching. Employers and recruiters might suspect your account is fake, and even if not, they’ll wonder why you don’t have a photo when practically everyone else does. It just seems odd, and brings unnecessary concerns. And choosing the wrong photo can also hurt you in your job search. So choose a professional-looking headshot to put on your LinkedIn profile. It doesn’t need to be perfect. But pick something where you’re dressed pretty well and look like you’re confident, smiling, happy, etc. 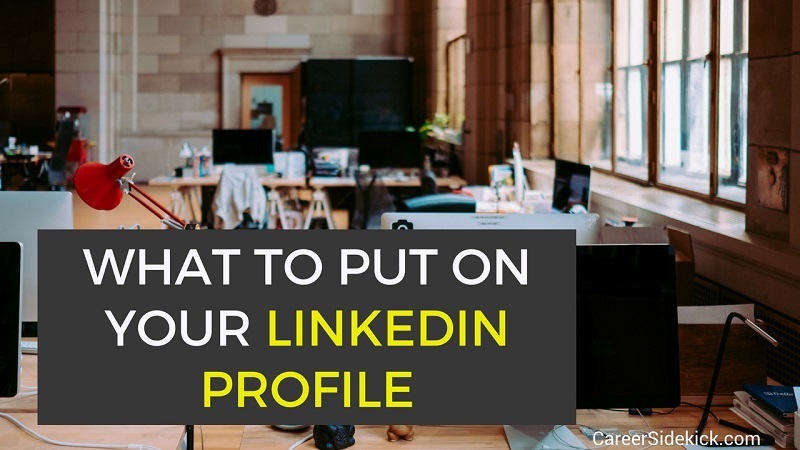 LinkedIn offers these 5 tips for picking the right profile photo if you want more help with this. After this, you can put things like education, certifications, and even community service/volunteer work. LinkedIn offers sections for all of these. You can also add different languages you speak to your LinkedIn profile. However, just like on your resume, the first things you highlight should be your recent work experience, accomplishments, and proof of your skills (in this case, the best proof is LinkedIn recommendations, mentioned in the last section). So focus on those things first when deciding what to put on your LinkedIn profile. If you follow these steps you’ll have a strong profile that catches the attention of hiring managers and recruiters in any job search.